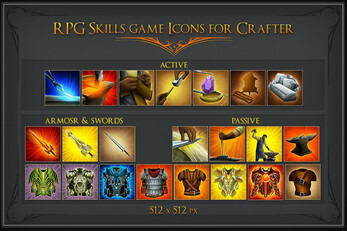 We present our collection of Free RPG Skill Icons: swords, armor and blacksmith skills. It includes 22 PNG files with a high resolution of 512x512. Perfect for those who create a role-playing game in the genre of fantasy. You can easily download and use them in your projects. Our team of artists will be happy to see their graphics in your interesting video games!